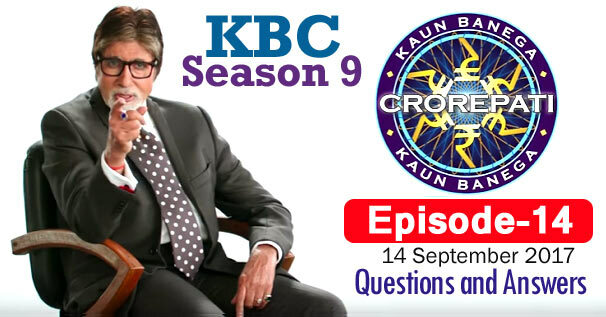 KBC Season 9 Episode 14 Questions and Answers: The fourteen episode of Season 9 of Kaun Banega Crorepati (KBC) was telecast on 14th September 2017. In which Amitabh Bachchan had asked contestants 12 questions of General Knowledge. The correct answer to all the questions is given below each question. By reading these questions, you can prepare yourself for the next KBC Season 10 of Kaun Banega Crorepati. Because by reading these questions, you will understand what kind of questions asks Amitabh Bachchan in KBC. These all general knowledge questions will be helpful to for you various Competitive Examinations and Interviews besides KBC. Remember, the answer to some question may be in accordance with that time, while the answer to those question may differ according to the present time. 1. Mawsynram and Cherrapunji, two of the world's wettest places going by average annual rainfall, are located in which state ? 2. Who is the author of the Hindi novels, 'Gunahon Ka Devta' and 'Suraj Ka Satvan Ghoda' ? 3. Who is the author of the Hindi novels, 'Gunahon Ka Devta' and 'Suraj Ka Satvan Ghoda' ? 4. In which neighboring country of India is Tamil one of the official languages ? 5. As mentioned in his speech, on what auspicious day did Finance Minister Arun Jaitley present the Union Budget for 2017-18 ? 6. The resting place of the Mughal emperor Babur is situated in which city ? 7. Which of these companies supplied ballot boxes for independent India's first elections ? 8. Which of these Indian Para-athletes won the gold medal in high jump at the Rio Paralympic Games ? 9. What according to 'My Experiments with Truth' did Krishnashankar Pandya persuade Mahatma Gandhi to learn ? (A) Sanskrit (B) Vaishnav Jana To..
11. What is The missing word in the proverb 'Jaisa ______ Vaisa bhesh ? 12. For preparing which of these food items you normally require a rolling pin ?